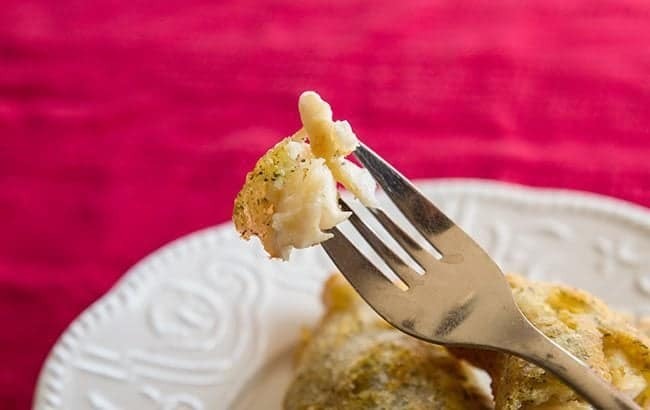 I’m a big fan of deep fried haddock and this recipe (made with a special trick) is one of my absolute favorite ways of eating it. The crispy batter and overall taste can’t be beat. I was told the secret for a proper, crispy batter for deep-frying fish a long, long time ago by a chef friend. Indeed, not only a friend, but the head of a culinary arts program at a local post-secondary school. While I have sadly lost the recipe he gave me in his cooking class that day (and truth be told, he told me it was an old fisherman friend who gave it to him ) I have always remembered that secret. So when it came time to try out the new Highliner Simply Fish line of products, I knew that I would be trying the haddock and that I was deep-frying it. For those of you who like to know where your seafood comes from, Highliner has criteria for their responsibly sourced seafood. It includes important criteria such as being OceanWise recommended or Seafood Watch rated green or yellow. Their six varieties of fish are sourced from the following places: Atlantic Salmon – Chile, Atlantic Cod – Iceland, Tilapia – Indonesia or Malaysia, Trout – Peru, Haddock – USA and Sole – Canada. Mike prefers deep fried haddock since it’s a nice milder fish and it is one of the best choices for deep frying battered fish. It holds up well and cooks fast. Look at that gorgeous fish flake. To be clear, I don’t and most likely won’t ever own a deep frier again, so don’t pass on this recipe because you don’t have one. I used to own one and it was honestly the biggest, messiest most annoying kitchen appliance that I have owned. It smelled and was always greasy on the outside no matter what I did. I have a large heavy frying pan that I use to deep fry in and let’s face it, deep frying isn’t really something that we should be doing so often that we need a deep fryer. Being rich in protein and healthy to boot, fish is always one of my top choices, however my family doesn’t always agree. Mike will eat haddock, which is why I chose to do this dish, but he also likes it deep-fried. Sigh. That man. Fresh fish is always, always better, especially when you are deep-frying it in batter. Frozen fish will have extra moisture no matter how you defrost it! 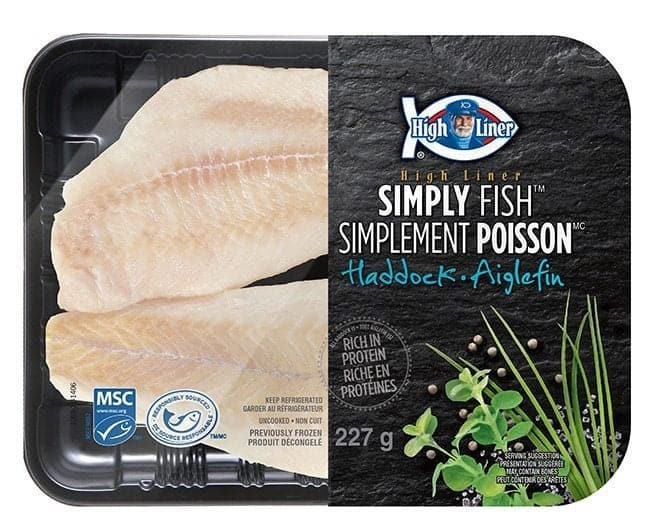 To that note, the Highliner Simply Fish are fresh in the package and you can find them in the fresh seafood department at No Frills, Superstore and Maxi. The cuts are very high quality (made from their finest cuts of fish) and are perfect for package to pan cooking. I also liked that they come in the exact right size for Mike and I to eat. 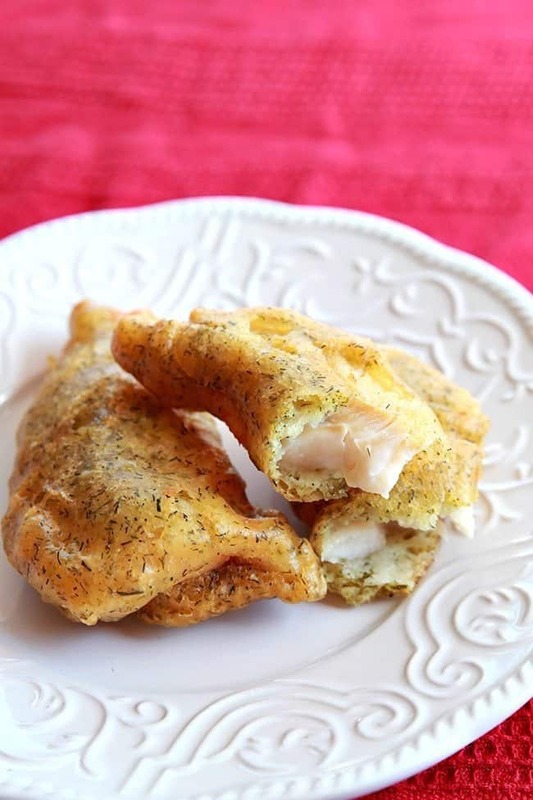 There are a few secrets that you have to adhere to in order to make great deep fried haddock. The oil temperature MUST be at 375 degrees. Hotter and it will burn and you will have raw fish inside and cooler will make the batter soaked in grease. No milk and no egg in the batter. This is as plain as you can get. You can sub in half beer and half water for sure, if you want. Use only thin and fresh fish filets, like the High Liner Simply Fish haddock. Do not use frozen. So who’s in for giving this recipe a shot? I am so excited, it passed the “Mike test” because I swear he is the pickiest person I know when it comes to deep fried haddock. So if he gives this a thumbs up, you know it’s a great recipe! 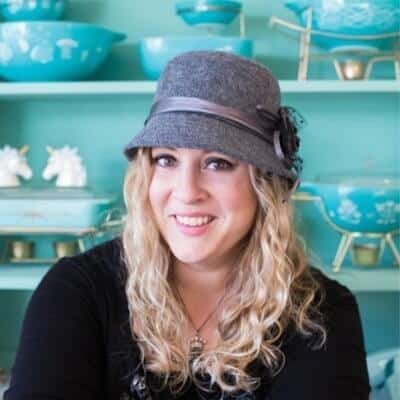 PIN THIS RECIPE to your DINNER RECIPES Boards and Remember to FOLLOW ME ON PINTEREST! 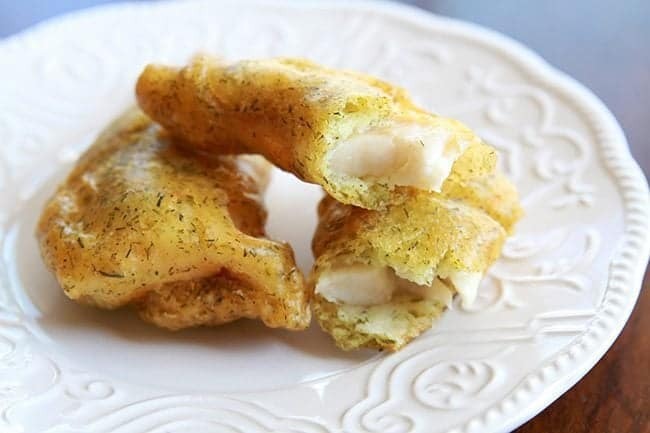 How to make the best battered, deep fried Haddock at home! Combine the batter ingredients and mix until smooth. Preheat 2-3 inches of oil in a heavysauce pan to 375 degrees F.
Combine the "flouring" ingredients together in a small bowl. Dredge the filets through the flour, then the batter until covered with a thick coat of batter. Cook two at a time in the hot oil, for approximately 4 minutes per side or until a medium golden brown. Remove and drain on paper towels. So, the recipe states – do not use frozen haddock. I have, each time I have made this and it is still great! So much better than some restaurants I frequent (and I live on Prince Edward Island!). Not mushy, crisp, not too much batter so the fish shines through! Not a big fan of deep frying so tonight will try to sauté in shortening. This is a great, no fail recipe…to be continued. Made this tonite, along with fresh scallops. AWESOME!!!! Family loved it. This would also make a wonderful batter for chicken fingers. THANKS SO MUCH!!! This rated a 5 star review. NOT very proficient on computer. Well, this is our go-to that we (and others we know) have used for years without a single issue. As you can see below, so have others. I’m not sure what happened in your case but thanks for trying it! Did you accidentally add the dipping flour to the batter?? This works perfectly for me! Ouch, working the graveyard shift? oh i made this one and it is fabulous!!!!! AWESOME~! I always fuss about recipes working out for people, glad this one was good! I saw this on the Food Network,that is hos I knew. corn starch,makes the fish crispy. http://highlinersustainability.com/our-progress/responsibly-sourced-criteria/ Here;s the link for their criteria. 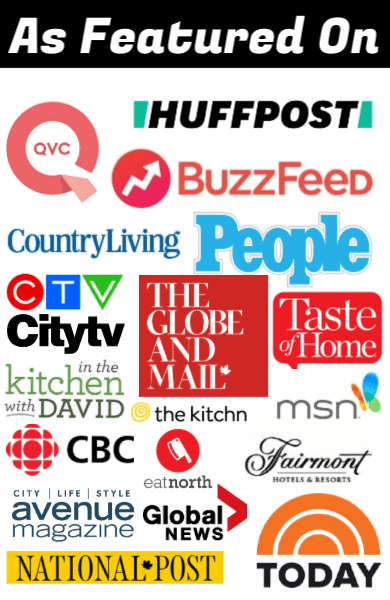 Most places are with the OceanWise program (restaurants, chefs, etc) but you can determine if this fits your needs! looks good though is High Liner not farm fish have to question…? Do you have a tartar sauce recipe to go with?! They should, make sure to check the FRESH section. They had a ton of them at mine. I am hooked. It’s seriously a great product and I’m so busy that I love stuff like this, ready to go with no work for me haha! my current one is electric, and pretty old, like probably 15-20 years. i’m waiting for it to die and then it’s gas stove time! That and a little something else! Yah there is just nothing like a good gas stove. I don’t have an electric skillet BUT I do have a gas stove, which is easier to maintain a good heat with. You do have some wiggle room temp wise but do aim to keep it around that 375 mark! I always feel so bad cooking my own fried food! But I guess it’s better than buying it somewhere cus I know how much oil and what kind it’s cooked in. I may have to give this a go. I don’t have an electric skillet though, so it’s really hard to control the heat and keep it at a constant 375 when you’re just using a regular ol’ pan on the stove. And I have yet to find a good food thermometer. That may be my only obstacle. It’s really simple but really good! Plus, you don’t need a deep fryer. I haven’t owned one in years! Easy, yummy, yup…it’s a keeper! But now I might have to make it more often hahahha! Mike loved it. It was a pretty fantastic lunch yesterday! And it’s honestly SO easy to make!